In night flying there exists a combination of things that culminate to create a difficult and sometimes uncomfortable experience for many of us. As a result, we tend to let fear of the unknown steer us clear of night flying. 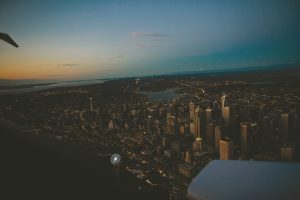 Let’s look at some of the reasons we tend to remain clear of the darkness and follow them up with tips to help overcome those hurdles and experience some of the best flying you can have. Ever hop into a rental car and realize your mirrors need adjusting, can’t seem to get the air conditioning right, it’s starting to rain, you haven’t figured out how the wipers work, and all while you are accelerating down the on-ramp for the freeway? Something as simple as an automobile, which should be old hat, is now a box of confusion. It seems that way to us when we hop into a plane at night despite being familiar with it. Where are the instrument panel lights? Why does my handwriting seem so small? I can’t see outside; where’s the defrost knob? Why are landing gear lights so bright?! Lack of comfort and familiarity can start you off on the wrong foot and etch away at your confidence in the airplane. Once we’ve finally managed to turn on the defrost and see outside, we struggle to get our bearings. Are the taxiway lights blue or green? Do they run along the edge of the taxiway or down the middle? You manage to find what a hold short line looks like at night, get cleared for takeoff, rotate, and suddenly lose all reference to the earth! An hour later you find yourself on a 3 mile final gazing at the PAPI like a moth to the flame…1 mile final…”Ok, you got this”….½ mile final…”Wow those PAPIs are mesmerizing, I’m right on the mone”…BAM! That black void actually was a runway. Shaken, you sheepishly taxi off and consider the multiple bounces down the runway as your three full stop landings. Contributing to your loss of cockpit familiarization and the alien world outside is fatigue. Ah yes fatigue, so effective it has its own letter in the I’M SAFE checklist. In the summer, when the sun sets late, we find ourselves as dozy as a kid struggling to catch the Tooth Fairy in the act. Excited? Yes. Alert? Not really. Fatigue grabs our eyelids with the weight of sandbags. Our brain becomes our worst enemy. “You’re an ace,” it whispers in your ear all the while laughingly inhibiting your cognitive and motor skills. In fact, your brain is the very same sandbag weighing down our eyes! Jerk. Fatigue is why we leave valuables in the plane after our night flights much to the elation of the early bird pilots preflighting the next day. We can all confidently agree that most if not all of the aforementioned events have been part of our past and possibly current experiences while flying at night. They are also, I’m guessing, major contributors as to why we don’t fly that often at night. Fortunately, they are poor excuses for having an aversion to night flying and if you’ve stuck with this article this far you’ll be convinced as such. Let’s take a crack at fatigue as it’s the most common issue with night flying. Fatigue exists all the time, but there are times when it thrives and times when it does not. Identify the days when you will be well rested and seize them. Take advantage of the time of year. Winter is a great time to get proficient and summer is typically not. Admit to yourself if you are a night owl or an early bird and fly in the evening or morning, respectively. Fatigue hates activity. Stay busy; whether it’s maneuvers, takeoffs and landings, or showing a friend the cityscape. If fatigue really has the ability to dig into you, avoid the three-hour cruise flights where you’re likely to suffer from the warm drone of the engine. During these longer flights, try tuning in each passing airport CTAF or VOR. It seems silly but it keeps you occupied. Not unlike the challenge your parents gave you of finding a speed limit sign that didn’t end in a “5” or “0” on road trips. If long night flights aren’t your thing, then remember fatigue also hates brevity. Shorten your flight time from that of a typical day flight. In fact, go up for just 30 minutes and return. You’ll be home in time for dinner and before fatigue has a chance to get comfortable. Slow down. Darkness has the ability trip us up during the simplest of tasks. Think about when you get up in the middle of the night to go to the bathroom: turn on the light and you’re blind. Keep it off and you’re not sure if the toilet seat is up or down. Sploosh. Acknowledge that you need to slow down and keep tasks methodical. Allow your eyes to adjust, organize your cockpit, know where the cabin lights are and pace yourself. Don’t start taxiing until you are actually ready to dedicate your eyes and ears to the outside. “Feeling” your way around the airport is a surefire way to hit another plane or cause a runway incursion. When airborne, climb and descend to known altitudes. Don’t deviate from them until you have cross checked with other resources such as airport lighting, terrain mapping, minimum safe altitudes on charts, etc. Lastly, if you really are squeamish about flying at night then take smaller steps. Our first night flight experiences are typically initiated in pure darkness and we stumble our way through it. A great way to work yourself into a comfortable proficiency level is to start your flight as the sun is setting. Stay in the pattern and if things get too uncomfortable simply call for a full stop landing. Start over on the next flight and see if you can fly just 10 minutes longer. The transition will help your eyes adjust naturally and you can segue your mind’s presets of outside visual cues from day to night. For many of us, night time flying consisted of a confusing and intimidating three hours of flying to meet the minimums for checkride and never to be attempted again. The result is an understandable resistance to flying at night and a tremendous misfortune to our diary of experiences as pilots. Don’t let this happen to you. Night flying has its risks. Identify those risks, adjust your behavior accordingly and you’ll open yourself to a whole new world of experiences that so few pilots explore.